How Brokeback Mountain didn’t win Best Picture at the Oscars in 2006 in still beyond me. It did win Best Directing, Best Adapted Screenplay, and Best Original Score. It was nominated for Best Picture, Best Actor, Best Supporting Actor, Best Supporting Actress, and Best Cinematography. But it lost out to Crash for the most coveted award of the night. Crash, of all movies; in what was already a weak year (Capote, Good Night and Good Luck, Munich), Brokeback Mountain lost to Crash, an over-the-top, ensemble cast, pseudo-poignant trainwreck starring a who’s who of b-list talent: Sandra Bullock, Don Cheadle, Tony Danza, Keith David, Matt Dillon, Jennifer Esposito, William Fichtner, Brendan Fraser, Terrence Howard, Ryan Phillippe, and Ludacris. You can tell I’m passionate about this, and about the fact that Brokeback in clearly the better and a phenomenal film, I guess some people just weren’t quite ready to understand that. In the mountains of Wyoming, two young ranch hands find work guarding sheep over a summer on the slopes of Brokeback, a period of time that will become when their lives truly started. Ennis is a quiet cowboy with a lonely past, someone who’s fixing to get married to a local girl, lead a simple, local life. Jack loves the road, is gregarious & outgoing, wants to start a ranch of his own someday. Up in the wilderness, the two men discover a surprising commonality; an attraction to each other that knows no reason. So begins a forbidden love affair, kept under wraps so Ennis & Jack can live their typical American lives, held secret against the dangers of being ‘that kind’ in that place. They would continue to meet as friends over the years, each setting down a different path in life, but neither ever forgetting the time they fell in love on Brokeback. To revisit the Crash debacle one more time, something that Brokeback did far better than that film was weave a talented, young cast together in an ensemble that never exposed their weaknesses and never took focus away from the leading men. Michelle Williams & Anne Hathaway were both great as the wives, both using this film to expose their true talent, to make us forget Dawson’s Creek and The Princess Diaries. Also, any movie that can make Randy Quaid look good is genius, supporting young actors too, like Linda Cardellini & Kate Mara, and featuring cameos by the now-known Anna Faris and the pride of Stranger Things David Harbour. But back to the film itself, which could not possibly have been stuffed more full of amazing cinematographical moments & beautiful scenes. It’s a lovely love story, after all, and it was done to perfection. Ledger & Gyllenhaal might not have done better to this day, and that’s including Ledger’s Joker and Gyllenhaal’s Donnie Darko. They were a magical pair, something that only comes along once in a decade, and they didn’t even get the full credit they deserved. 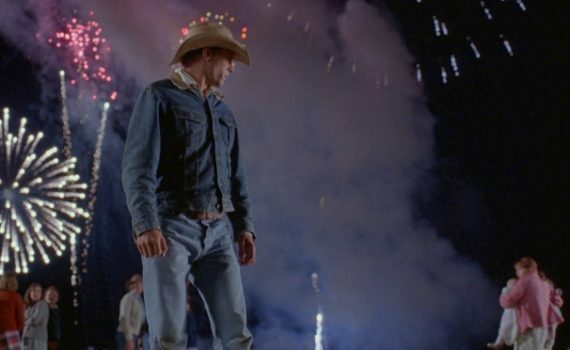 After all this time, Brokeback is still an incredible film, one that perhaps audiences weren’t ready for at the time, but one that I hope they can respect now.